8 Unexpected and Creative Promotional Aids. It’s no secret that promotional aids can provide creative marketing solutions for companies of all sizes. For years, promotional aids such as tote bags, beverage holders of all shapes and sizes, and t-shirts have been helping spread the word about companies to the greater public. However, sometimes you need to think outside of the box to stand out. While the aforementioned promotional aids are always great choices, if you’re looking for a new and different way to really wow customers, consider one of these eight unexpected and creative promotional aids. From magnetic floating displays to kites and even paddle boards, Above All Advertising offers promotional aids that are bound to make customers take notice and improve your branding. Across not only the nation but around the world, SUP (stand-up paddle boarding) has caught on as a fun and trendy recreational fitness activity. You can capitalize on this trend and increase brand awareness by investing in inflatable stand-up paddle boards. These easy-to-assemble promotional items will act as an enticing and cool marketing booster for your company, and help establish you as on-trend and cutting edge.Personalize your inflatable stand-up paddle boards with your logo and company colors for maximum effect. These promotional items make a great gift for investors or vendors, and are bound to make your company stick out in people’s minds. Time has proven that some of the most successful promotional items are those that can provide a functional service. While tote bags and beverage holders are classic promotional items for this reason, a customized clockis just as useful but less expected. Think about it: with a promotional clock, your customers are literally exposed to your brand every time they glance at the wall to check the time. That’s a lot of times per day! Featuring your logo in the center and large, easy to read numbers, this 10.25-inch diameter clock is a functional and beautiful promotional item that is available to order in quantities as low as 6 units! If “out of the box” is what you’re going for with your promotional aids, look no further than the floating magnetic display. This unique display unit is appropriate for retail, showrooms, and even trade show floors, and is bound to make customers flock to you with curiosity. Featuring patent-pending magnetic technology, this unique display makes the product or item of your choice (up to 13 ounces) levitate, continuously revolving in space. Augmented with spot LED lighting, this display is bound to attract potential customers who want to know, “how’d you do that?”. This promotional aid provides the perfect ice breaker, inviting conversation with potential customers and exposing them to your brand in a cool and attractive way. 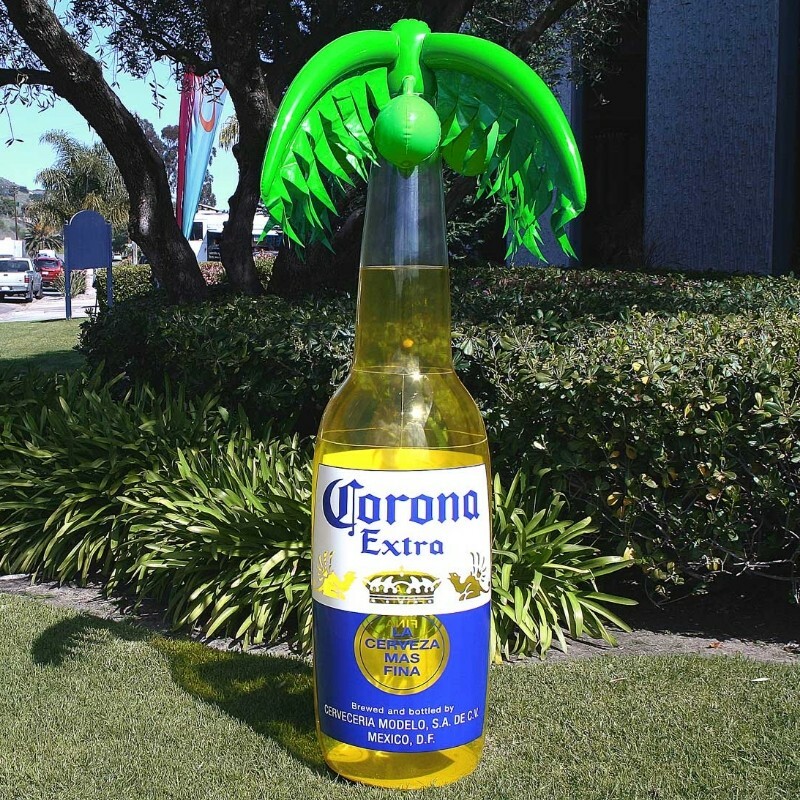 Few promotional aids have the power to delight like custom sealed inflatables. In essence, you can create a 3-D version of a company mascot, product, or the likeness of any item which can help promote your brand. These approximately 16-inch inflatables have a super-high degree of customization, and can be made in the shape and colors of your choosing. This makes them perfectly tailored to your brand, and perfect for promotion. Whether you’re displaying them at a trade show, using them as promotional giveaways, or using them to create a dynamic retail display, custom sealed inflatables are proven to increase sales and brand awareness. It’s likely that you’ve never considered customized blinds/shades as a promotional item, but you should. 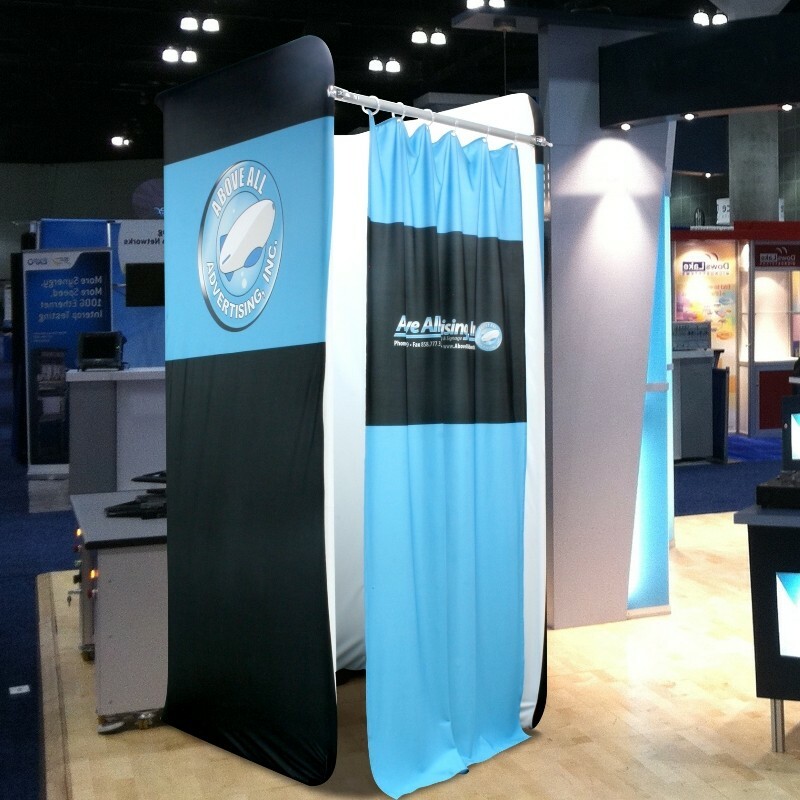 Our Triton™ Printed Blinds are a truly unique and eye-grabbing promotional aid. Available in a number of different sizes, they provide an ample canvas to really showcase the artwork of your choosing. These blinds are appropriate for both residential and commercial applications, and can be printed with the custom graphics of your choosing. The design possibilities are endless! Perhaps you’ll showcase a product image, or just emblazon your blinds with your company’s logo and tagline. Either way, every time the sun comes out your blinds will capture attention on these roller shades! They can truly enliven a business or any room in which they are placed. If you’re exhibiting at a street fair, music festival, or trade show, you’re guaranteed to garner attention with a customized changing station. Customers have rarely seen something like this! These portable and compact dressing rooms feature the unique Fabsta™ style stretch fabric exterior that is growing rapidly throughout the exhibition industry. But its appeal isn’t just aesthetic. This popular item provides a great solution for events out in the public, or can provide a helpful promotional aid at photo shoots. Anywhere can be “on location” in a jiffy with this unique promotional aid. It’s a bird...it’s a plane...no, it’s an incredible promotional kite! Kites provide a fun, novel promotional item which establishes your company as fun-loving and creative. It’s also an eye-catching promotional item which acts as a flying billboard of your company! Choose a template for a custom kite, or submit your own design. Your logo printed on a kite will improve your branding with flying colors (literally)! If you run a bar or restaurant, the beer tube is the perfect tabletop dispenser which can increase brand awareness, enhance your atmosphere, create a conversation starter, and perform the valuable function of keeping beverages cold! While it’s called a “beer tube”, don’t let that hold you back: this display can be used for all sorts of beverages both alcoholic and non-alcoholic, including vodka, orange juice, rum and coke, whiskey, and soft drinks. These customized drink dispensers assemble quickly and travel easily, so they can be used either in a food service space or taken outdoors for festivals or street fairs, which makes them versatile and appropriate for a number of different settings. Not only do these drink dispensers help advertise, but they help build positive identity for your brand as a design-savvy and on-trend company. Various sizes and templates are available so that you can customize your drink holder to be appropriate for your unique business. Conclusion: Promotional aids can be a great way to improve your company’s brand identity and start conversations with customers. In today’s saturated market, it’s important to stand out in the crowd, and creative, out of the box promotional aids can help. Above All Advertising offers a number of creative and sometimes unexpected solutions; see for yourself if one of these creative and unique options can help improve your company’s visibility and gain you more attention! Which is your favorite creative promotional aid?